Domestic concrete can range from all manner of jobs including driveways, walls, patios, extensions, etc. All of this can be greatly enhanced by using 365’s superior standard concrete mix. We don’t cut costs at 365 Concrete and provide only the finest grade materials on each of our jobs. This ensures the finished product is built to last. Our modern fleet of Volumetric Plant vehicles are the perfect tool in this day and age of concrete delivery. All concrete is mixed on site and to spec which eliminates most of the mess. This also cuts out the problem of over ordering. We also have the ability to adjust the strength of the concrete on site if need be. With competitive pricing and a highly skilled team, you will always get quality service and at the right price. Whatever the size of your domestic job, 365 Concrete has the tools and skills to do, making us the best choice in the area. Contact our friendly team now to find out how we can assist you and let’s get your domestic building project complete, together. For our concrete driveways we use a C35 type of concrete mix which can be mixed with additional additives making it more versatile, and will also shorten the length of time for the concrete to set. A simple concrete driveway can also be used as a foundation for a more decorative design, many of our customers opt for patterned concrete or complete their drive with paving slabs. If you’re inexperienced about concrete strengths then be sure to talk with your builder, and if you’re doing a this for the first time yourself our friendly team are available to provide you with more information. Don’t forget to try out the Concrete Calculator also to give yourself a rough estimate of what you might need. At 365 Concrete we provide quality concrete for a variety of different domestic foundations. Because of the quality of our concrete, it’s durable, versatile, and perfectly suited for your domestic project. We also offer a professional concrete pumping service for those hard to reach or restricted access jobs, ask our team for more information. After we’ve laid down your footings or foundation, our concrete is usually ready for brickwork after 24 hours, weather permitting, letting you continue with the project with minimum downtime. Our domestic concrete foundations have a variety of uses ranging from wall supports, pathways, sheds, out house, and more. IF you need more information don’t hesitate to contact our team. When it comes to sizing up your foundations, we’ve provided a handy calculator to give you a rough estimate of what you’ll need. The standard mix for domestic foundations is C25, but if you’re unsure then your builder will be able to guide you in the right direction. If it’s a first time project for yourself then please get in touch with our friendly team. 365 Concrete have you covered for a range of different concrete types and strengths with specialist mixes, designed for outdoor and garden pours. Our concrete is the ideal base for any paving design or landscaping project but also for something as simple as a garden pathway, steps, or a patio. Getting the right concrete measurements for these kind of jobs is never easy. You can easily get a rough estimate with our Concrete Calculator though. For most garden pours we’d use a C25 mix of concrete, but please check with your on site landscaper or builder first hand. 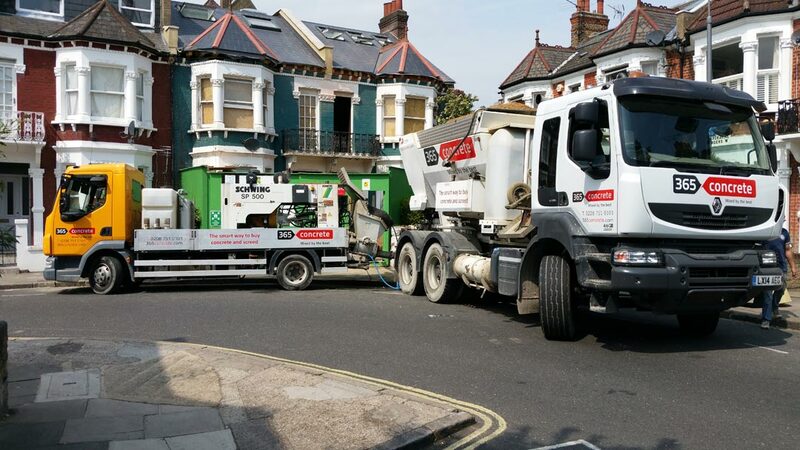 Restricted access or hard to reach garden areas are not an issue if you use our 365 Concrete Pump service. This service is perfect for those awkward jobs that require little to no mess. Get in touch with our team today to discuss your needs and get a free quote. 365 Concrete offer the perfect solution for your Shed, Out House, Storage, or Garage area with our concrete base. This leaves you with a strong and versatile foundation for your project. For those hard to reach and restricted access garden areas, our 365 Concrete Pumping service will also save you time, hassle, and money. Ask for more information. It’s a durable and long lasting concrete base that can easily be adapted to a seating area if your project changes without the need for paving or wooden bearing. For concrete bases we would use a C25 concrete mix but be sure to speak with your on site builder before ordering. Please try out our Concrete Calculator also to give you a rough estimate of the concrete slab needed for the pour. Get in touch with our team now for more information.